January’s spate of deadly attacks in Libya and in Afghanistan on the offices of Save the Children and at the Kabul Intercontinental Hotel are distressing and poignant reminders of the harsh realities facing local civilians and foreign workers daily in these volatile regions. Medlink has a long-established client base in North Africa, and we serve our clients internationally working in extreme and remote environments as well as more politically unstable parts of the world. These locations are demanding on numerous fronts. They require meticulous planning of the required medical supplies and personnel not only in regards to the likely health and environmental risks but also to handle emergency situations, whether natural or man made. At the core of any Medilink client assignment lies emergency response planning which forms the cornerstone of our consultancy work and is carried out well before the deployment of medical supplies and personnel. It is all too easy to view Medical Emergency Response Planning as a type of ‘insurance policy’ and an extraneous service. However, at Medilink it is the most critical aspect of remote medical service assistance. It is only when it is called into action that the true value of meticulously-scoped emergency response planning comes to light. Emergency situations cannot be carried out ‘on the fly’; equipment, and specialist personnel who are drilled and briefed, need to be on permanent standby to provide a professional, rapid response in an emergency. To ensure the right response, our Emergency Response Specialists work with our clients to assess the resources available at the location to respond to emergencies. We then develop thorough emergency response plans tailored for the operation. We also work with our clients to carry out drills to assess the plans. Our process takes into account location and size of the project, risks involved, key requirements and availability of resources. The documentation we deliver to our clients provides a blueprint for the type of services needed and identifies the recommended steps to ensure that the service is reliable and cost effective. We provide full scoping documents detailing all requirements which are ready for our client’s implementation. At Medilink, we operate to strict clinical governance guidelines which come into their own in emergency response planning and the activation of response teams and services. Clinical practices carried out during emergency situations are continuously monitored to ensure we have a thorough audit of each deployment. This review process ensures we maintain the highest standards of both emergency medical services and patient care. Medevac services are often thought of as the repatriation of individuals who have suffered trauma rather than of mass injury situations. However, incidents such as those witnessed in Benghazi and Tripoli in January 2018 highlight the need for emergency response services that are able to cope immediately with numerous casualties or trauma patients. At Medilink, we are able to provide medevac services to cope with both types of emergency situation. First in the chain of command is our 24-hour Emergency Alarm Centre based at our headquarters in Malta. 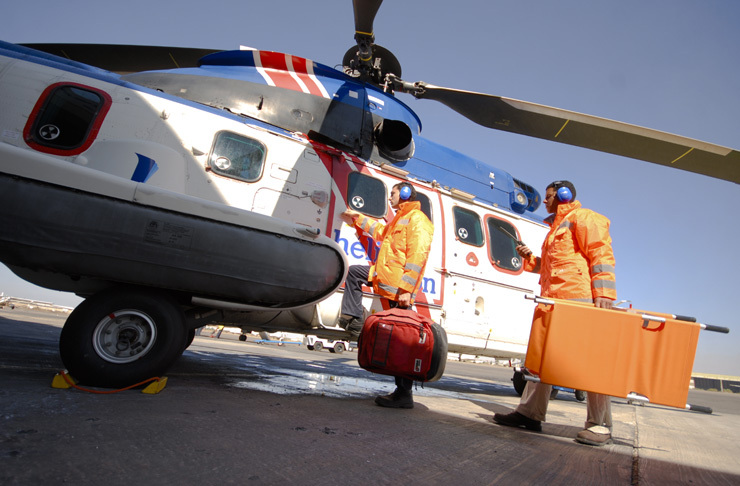 Staffed by aero-medical and topside support medics, the emergency alarm centre activates the emergency response plans already in place and sets in motion the deployment of appropriate medevac services. Medilink operates a fast, reliable medevac service internationally working with our own fleet arm MI-AA, as well as through an extensive global network of aviation service providers. All medical personnel that form part of the flight crews are exceptional individuals and highly-qualified professionals with aero-medical training. An immense team is involved in even a single medevac situation to ensure the entire cycle of medevac is conducted seamlessly across all five phases of a successful medevac: Activation, Mobilisation, Medevac, Hand-over, and Post-flight review. We have over 20 years’ experience in operating medical services in Libya, and have continued our presence in the country uninterrupted during this time. Medilink has a permanent, dedicated clinic in Tripoli, and we have over the past two years extended our North Africa presence to neighbouring countries with a clinic at Hassi Messaoud in Algeria and more recently our office in Cairo, Egypt. These bases provide us with vital local insights and immediacy of supplies and enable us to enhance our logistics and provide more rapid delivery of services to clients operating further afield in Africa. In addition to serving clients in the oil and gas sector, our Egypt office is geared in particular to assisting other multinational corporate entities, such as leisure and hotel groups, as well as NGOs and charities operating on the African continent. As we have seen, Emergency Response Planning is far from a theoretical exercise. The micro level of detail covering supplies, personnel, equipment and procedures make it possible to execute rapid response medical services as if they were routine. However, each client and location demands bespoke planning on our part to ensure the unexpected is countered with exceptional rapid response services that can help save lives. For more on our dedicated medevac services, see MI-AA.